New York Yankees: Will Austin Romine remain the Yankees Back-up catcher? 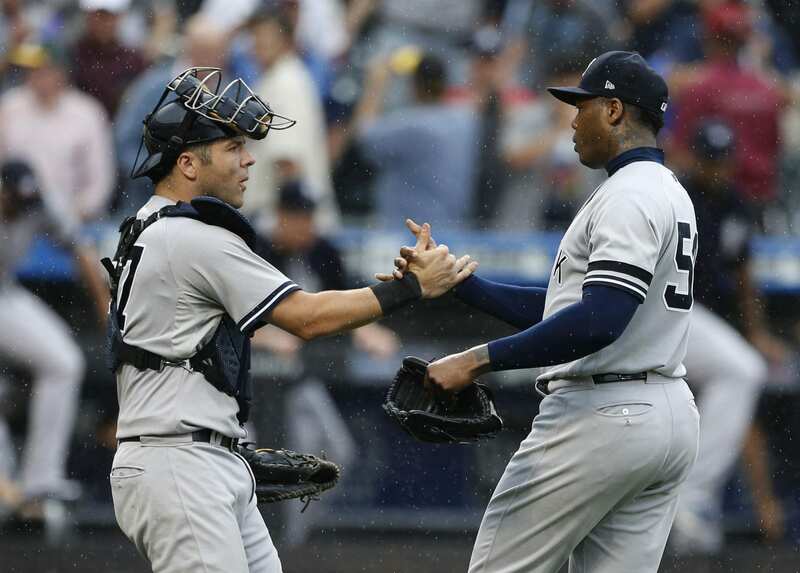 Home New York Yankees New York Yankees: Will Austin Romine remain the Yankees Back-up catcher? In 2018, New York Yankees catcher Gary Sanchez missed a good portion of the season because of groin injuries throughout the season. When he went down, back-up catcher Austin Romine did a great job behind the plate, but in the case for Yankees fans, did Romine do “too good of a job” in the sense that he could be traded to another team to take the role as a starting catcher? If that were to happen, would Kyle Higashioka do a good enough job as the back-up? Is Romine deserving of a starting job elsewhere? Around the trade deadline last season, the first rumors emerged that teams would possibly be interested in acquiring Austin Romine in a trade for a pitcher. He caught a good amount of games from May into mid-summer when Sanchez was rehabbing his groin and found himself on the DL twice. In 242 at-bats in 2018, Romine hit .244 and had an OBP of .295 while slugging .417. In addition, he had 10 HR and 42 RBIs. He has shown in the last three seasons that he is a more reliable defensive catcher with a fielding percentage of .994 and a significantly less number of pass balls, compared to 18 passed balls for Sanchez in just 74 starts behind the plate in 2018. Another thing that attracts teams to Romine is his work ethic and passion of the game. In 2018, he won the Yankees “heart and hustle award”, and has previously worked so hard to try and get back to the major leagues after limited appearances in 2011, 2014, and 2015, and no appearances in 2012. He’s also been known to stand up for his teammates and call out opposing players when need be. His most famous example of that is his brawl with Miguel Cabrera in 2017 against the Tigers. Could Kyle Higashioka do a good enough job? Kyle Higashioka has also been constantly working as hard as he can for his shot. Despite many trips up and down from AAA since the beginning of 2017, he wasn’t able to get his first until 2018 when he hit a long home-run during Sunday Night Baseball against the Red Sox. His first three major league hits were actually home-runs but only hit .167 in 72 AB. He did have solid defense, with just one error in 20 starts, but his arm needs work. He would generally put the throws on target, just not quick enough. Higashioka clearly had trouble at-bat in 2018, and also struggled in AAA batting only .202. With that average, he should be lucky that the Yankees were relatively low on catching options because he could have easily been sent down to AA. His fielding percentage was even slightly lower with Trenton, at .986. Kyle Higashioka clearly needs work to be MLB ready. Besides his fielding percentage, his hitting numbers are nowhere near ready to be the MLB back-up catcher. If the Yankees were to trade Romine, they would need to receive a MLB ready catcher in exchange or sign an MLB veteran catcher, or claim one off of waivers. Veterans Matt Weiters, Caleb Joseph, and Stephen Vogt are all free-agents and could work as a back-up if a trade were to happen. New York Yankees: Can Dellin Betances Continue His Dominance?